Millions of sports lovers are thinking about just one thing right now -- the Winter Olympics in Sochi, Russia. Close to 2,900 men and women are set to compete in the 2014 Winter Games. The opening ceremonies were held Friday night. The games continue through Sunday, February 23. The Olympics are bringing a lot of attention to Sochi, a city on the Black Sea. Sochi is a popular area for vacation travelers. The area is known for its mild winters, with warm to hot weather in the summer. At least $50 billion are being spent on the 2014 Winter Games, making it the costliest Olympics in history. Seven billion dollars was spent on the 2010 Winter Games in Vancouver, Canada. Olympic officials chose Sochi to host the 2014 games almost seven years ago. Russian President Vladimir Putin (C) and Olympic Village Mayor Elena Isinbaeva (R) visit the Coastal Cluster Olympic Village ahead of the Sochi 2014 Winter Olympics at the Athletes Village in Sochi, Feb. 5, 2014. At the time, Russian President Vladimir Putin said the games would cost about $13 billion. Yet the real cost is four times his estimate. So where did all the money go? Many Russians say people involved in the project have taken some of it. One research group found that 38 percent of Russians it spoke with said the Olympics increased the likelihood of corruption. Other observers say the high cost is partly the result of security measures. Brian Jenkins is a terrorism expert from the RAND Corporation. "There are anywhere between 70,000 and 100,000 policemen and military troops deployed around the city. In addition, we hear reports that Russian authorities are going door to door in Sochi looking for suspects." The main threat comes from separatist and Islamist groups from the North Caucasus, especially from Chechnya and Dagestan. One group claimed responsibility for two suicide bombings in Volgograd last December. The attacks killed more than 30 people. The city is only about 600 kilometers away from Sochi. Bruce Hoffman is a terrorism expert from Georgetown University in Washington, DC. He says the increased security makes Sochi a difficult target for terrorists. He says they probably know they cannot get close to those attending the games. "....But they can, and I believe their intention is to, make life difficult for the Russians and to create some sort of incident that takes away from the enjoyment and the sporting spectacular that is the Winter Olympics." The last time Olympians from around the world competed on Russian soil was in 1980. That was a year after Soviet troops invaded Afghanistan. Sixty countries boycotted the Moscow Summer Games. 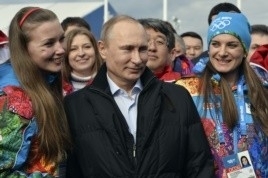 Thomas de Waal, a British journalist, says President Putin has a lot invested in the Sochi Olympics. "He is a man who, as we know, has made his whole brand about being this man who has put Russia back on the map. He has made Russia strong again, respected again, a place of prestige." As the games began, protesters were criticizing Russia's treatment of homosexuals. Critics of a Russian law recently demonstrated in 20 cities around the world. They said the law bars nearly all public discussion of homosexuality. President Barack Obama is not sending any top officials to the Sochi Olympics. Instead, the US delegation includes tennis great Billie Jean King and two other openly gay athletes. Editor's Note: For the latest news from the Sochi Olympics, go towww.learningenglish.voanews.com. The president said he had no intention of deploying ground troops. Opposition leaders had called for a boycott of the vote. It was his responsibility for foreign affairs that gained him international prestige. 1.In addition, we hear reports that Russian authorities are going door to door in Sochi looking for suspects. She helped clear ditches and even went door to door offering well-cleaning for free. He worked as a door-to-door salesman peddling cloths and brushes.